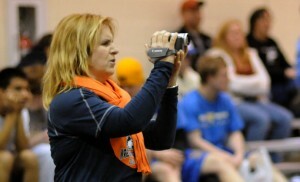 Wrestling Mom author Michele Weldon videotapes her son. I am a journalist, author, educator and mother of three. And for 12 years in season I was in the stands dressed in the school colors screaming my sons' names. I shot video of Weldon, Brendan and Colin on two different cameras. During my oldest son, Weldon’s, last high school varsity wrestling season in 2007, he placed fourth at the Illinois state championship while I recovered from breast cancer. Two years later, my middle son, Brendan, won the Junior Varsity championship for 171 pounds. My youngest son Colin wrestled varsity as a sophomore at 119 pounds for the team that won the Illinois team title in 2009. In 2010, he wrestled and won regionals at his weight, but was injured with MRSA. In the 2010-11 season, Colin wrestled well at 130 until a concussion on January 22, 2011 ended his seasons and knocked out his dreams for qualifying for state. His final senior year he wrestled well, but missed making individual state. This website is built around a recently completed memoir about community and family surrounding a sport that is widely misunderstood. Tell someone your son wrestles and he or she either understands instantly or equates it with the platinum-blond barbarism of the WWF. Others think all the boys have eating disorders. Many say it is just plain gross. But I know better. For my boys, wrestling was more to them than practices and matches, singlets and warm-up suits. It was a way for my sons to form an identity, to become better people, to channel their emotions. It gave them another family. It gave them good men to imitate in the coaches and strong friends to lean on in victories as well as challenges. Wrestling filled their lives with something good, something they achieved, something they were proud of, something they owned, even if what they owned at times were losses. And there through all of it, for all of them, was and is an amazing coach, Mike Powell. Now that I am just a Wrestling Mom Emerita, I don't have to worry about my sons thinking aI am bragging about them. But this is a place where I tell the truth about what wrestling has done for my sons, and how it has shaped their lives, and mine. They are men, now 24, 22 and 19, all with fond memories of wrestling and their beloved coach, Mike Powell, who remains a friend and mentor to all three. I am pleased I spent my time the way I did. I never dreamed of missing a match to say, go to the movies, take a nap or meet a friend for lunch. I always figured I would not be proud of the epitaph, “She always had a recent pedicure.” So I went and sat in the stands. And screamed. I learned what it meant to be a better parent. I have learned what it means to go all out "whistle to whistle." This site is about a complicated life, the kind so many of us lead. About trying to balance caring for my sons and supporting my own ambition. It is about trying to move ahead with challenging work as an author, journalist, keynoter, assistant professor at Northwestern University and still have a life outside of all of it that makes me feel full. Like all of us, I am trying to manage it all, do it all and still laugh at the end of the day. I welcome your advice, your stories and your support, as I lend mine to you. We all have a lot to wrestle in our lives; we just hope most days we don't get pinned.